A frivolous subject to some, but a no-nonsense situation to cattle ranchers and property owners in South America. For a very long time, reports have emerged from isolated farms and suburban residences involving the complete and utter absence of water from in-ground pools and large open water tanks for the sort seen on farms. Very rarely do the victims of this “exfiltration” leap to the conclusion that saucer pilots have stopped by for a sip of H2O: conventional explanations have invariably been sought first – leakage by sudden cracks appearing in pools or the seams of water towers, for example. But the liquid vanishes far too quickly – overnight – for this to be a normal occurrence. An average in-ground swimming pool with a ten thousand gallon capacity will require electric pumps and many hours, perhaps even a day, to empty completely, with the inevitable flooding of the grass surrounding the structure. A mammoth water tank holding five times the amount might take days. Yet the disappearances always occur overnight, or in even less time. The unexplained nocturnal lights – believed to be extraterrestrial craft by some, “witches” by others – were reported frequently during that year’s mutilation wave. Descriptions of these sources of light varied, but they were invariably seen on clear nights with out a hint of stormy weather. Most reports agreed that the lights were white orbs that would turn blue during their high-speed maneuvers, making abrupt starts and stops before whizzing out of sight. Fear of ridicule, and even greater fear of having their lives disrupted by curiosity-seekers, kept eyewitnesses from making more of these experiences known to the media. A witness interviewed by “Nuevo Día” said that the lights’ behavior was so out of the ordinary that her daughter, who now lived in the city, was afraid to come out into the countryside to visit her parents. People were going to bed early and barricading their doors, just in case. The village of La Adela, which at the time had the dubious honor of being the location most affected by the cattle mutilation epidemic, had also reported missing water from its water towers. This was perhaps the more mind-bending anomaly to the local ranchers, as the magnitude of the water held in these containers was between twenty and thirty-five thousand liters (5300 and 9300 US gallons respectively) -- oceans of water that would have taken a number of tanker trucks to empty and cart away, and the average tanker truck has a three thousand gallon capacity. In any case, there were few vehicles of this size were to be found in these rural areas. The same report by Proyecto Condor mentions an interesting side note: “Another remarkable thing that occurred last Sunday and Monday (week of July 28, 2002) was that a lemon tree near [the site] was found completely devoid of leaves. This could have been caused by the wind or a heavy frost, but these causes were discarded upon ascertaining that the remaining trees were intact.” While unrelated to the water disappearances, it is reminiscent of a case mentioned by Spanish ufologist Salvador Freixedo in his book Visionaries, Mystics and Contactees (Illuminet Press, 1992) involving an unidentified object that hovered over a tree, causing it to wilt and shed its leaves within hours. Perhaps little attention would have been given to the weird disappearances if the phenomenon had not occurred in suburbia as well. The residential outskirts of the communities of Ugarte, Toay, Miguel Riglos and Macachín, among others, began reporting cases of “missing water”, but this time from in-ground swimming pools. 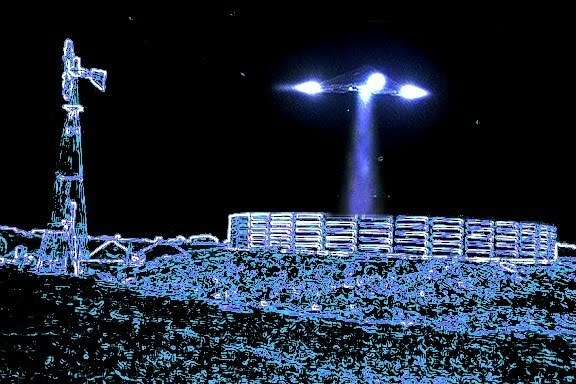 On June 23, 2002, the city of Jacinto Arauz – well known to readers of INEXPLICATA as a frequently mentioned area for strange phenomena – reported cattle mutilations and the draining of several water towers. In July, a rancher the wilderness of San Germán in the Province of Buenos Aires found that his water tank, stocked with water the previous day, was completely empty the next. Another farmer had noticed “intense lights” in the sky during that week. The upshot of the high-strangeness wave of 2002, according to statistics gathered by the Fundación Argentina de Ovnilogía (FAO), included a grand total of eighty instances of “missing water from Australian tanks”, with the city of Goyena, Buenos Aires Province, in the lead with 6 tanks drained of their contents. Stranger still was the case from the community of Buena Vista near the “Pacifico” wilderness, where two large tanks were found drained, were subsequently refilled, and then drained again by mysterious forces. Luis Burgos of the FAO had also noted that cases involving mysterious “ground marks” -- apparently left from above by unknown forces – invariably took place beside small swimming and wading pools. He cited a number of cases, including a 1991 case in Paraná and an earlier one in Yerba Buena (Tucuman Province). During a presentation at the II Congreso Internacional de Ufologia held in the city of Victoria, Entre Rios in 2009, distinguished researcher Oscar Mendoza presented an in-depth examination of the affinity between unidentified flying objects and water, particularly small bodies of water such as pools, ponds and tanks. He noted that the small, bright lights reported during the 2002 cattle mutilations wave could best be described as drones remotely operated by another craft, with a predilection toward lagoons and estuaries, singling out such locations as the Esteros de Iberá in Corrientes and the Setúbal Lagoon in Santa Fé among other locations. Mendoza theorizes that the putative “drones” are engaged in sample-collecting missions (a 1960s and ‘70s notion that may sound quaint to us nowadays) but that the still waters of the “Australian tanks”, estuaries and swimming pools, which are perfectly still and unused in the winter months, contain types of algae that may be of interest. Water would be drawn up through the “tractor beams” reported in many cases and subsequently dumped in an unknown location after the algae had been separated. Blue-green algae, particularly spirulina, he theorizes, would be of particular interest to alien visitors for its medicinal and curative properties. But incidents involving the mysterious removals of water did not end with the cattle mutilation wave. In early January 2006, close to twenty thousand liters of water disappeared overnight from a water tower in Cañada de Luque in northern Cordoba Proivnce. The tank’s owner, Domingo Ordóñez, had checked on the water supply the previous day, and could not understand how such a massive loss could have occurred in less than twenty-four hours. No traces of water seepage were found on the tank upon subsequent investigation. Although the prevailing temperature had been in excess of one hundred degrees Fahrenheit, the rate of evaporation could not account for the disappearance of the fluid, particularly when the tank was equipped with a pump device that would re-supply it if the water went below a certain level. A report provided by the Circulo Ovnilógico Riocuartense (C.O.R.) indicated that barely ten centimeters of water remained in the tank. No traces of disturbed sediment were in evidence and the tank showed no outward signs of humidity. Researchers from the organization canvassed Ordoñez’s neighbors to see if any unusual objects had been seen in the sky the previous evening, but their efforts were in vain. For the sake of completeness, it should also be mentioned that large glacial lakes in the Andean Cordillera were also drained. This was the case of the Témpanos lake in southern Chile, whose waters disappeared in 2007, leaving icebergs stranded on the rocky lake bottom. Scientists explained that the water had vanished through crevasses. Similar phenomena, however, had not been reported before or since. Pachi LaFata, a reporter with Argentina’s Diario Popular, uncovered a missing water case that had been concealed by the military since it took place in November 1999 at 12th Infantry Regiment Base in the city of Santa Fe. The armed forces succeeded in covering up the fact that a one hundred thirty foot flying object had not only hovered over the facility, but that an aboveground water tower and two underground cisterns had been left without a drop of water. The story finally emerged in 2010 through the efforts of the Visión OVNI research group and its investigators Luis Brussa, Ariel Maderna and Fabian Rossi. Brussa, the lead researcher, managed to secure permission from the base commandant to conduct an investigation, even after having plainly stated the nature of the research and the conclusions that would be published. Sergeant Carlos Villano, who had been present at the 1999 experience, told the Visión OVNI crew that it all began with a phone call from the director of the grade school that operates within the base’s perimeter. The administrator indicated that the building’s rest rooms were out of water, and the subofficer had been dispatched to look into the situation. He discovered that both the cistern and water tower were devoid of fluid (the researchers noted that the cistern was 50 feet deep and eight meters in diameter). At the same time, the subofficer noticed a strange circular impression on the ground. More importantly, the Visión OVNI researchers managed to speak to direct witnesses of the incident: one was a twenty-five year old custodian at the time, and was playing soccer at the base’s soccer field. After 21:00 hours, the custodian and his cousin noticed a bright light in the water tank’s direction, but thought it came from the headlights of a heavy vehicle coming down the street. It turned out that some local residents had also felt strange buzzing sounds and electrical interference at the time, with brown-outs throughout the area. Others reported seeing a circular light flying at low speed and with an estimated diameter of 98 to 130 feet. UFOs (unidentified flying objects in the strictest sense of the acronym, not alien spacecraft) have reportedly helped themselves to water all over the world, mainly from open sources like lakes and seas. Perhaps the reader will be most familiar with the 1966 UFO sightings over Pompton Lakes in Northern New Jersey, where local authorities received phone calls from frightened local residents reporting “shining lights flying over the Wanaque Reservoir” and exerting a strange influence over its waters, causing it to be “drawn upward...sucked upward” an estimated 250 feet into the air, according to a police report. Argentina: Entire Family "Photographed a UFO"